I got the second over one section and bargello finished up yesterday. Now I'm on to the alphabet section above it. I also got a bit of stash from Down Sunshine Lane yesterday. I got some linen to stitch a few of the Blackbird stockings and LHN's "Bee Sampler. 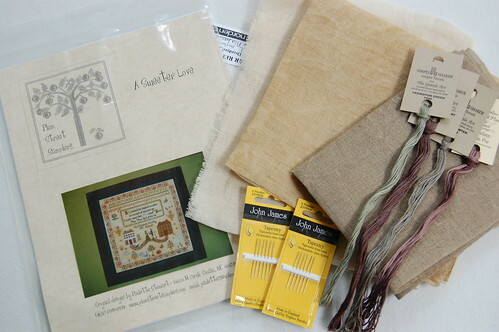 I also got Plum Street Samplers "A Sweeter Love" pattern and Annie Beez "Colonial Revival" pattern (not pictured). Hi Nicole, nice to 'meet' you. 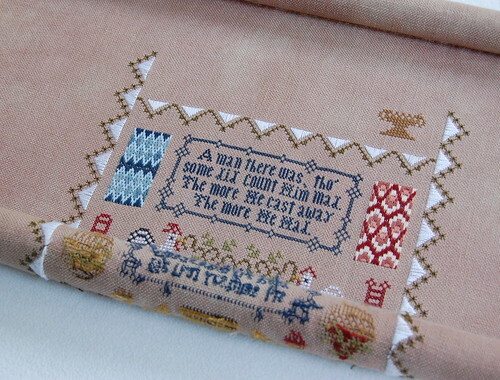 You have a lovely blog and you do such beautiful stitching. I love your WIP's, especially the riddle. Nice littel stash hual theree lady. The riddle looks wonderful - such great colors. I like your new patterns - especially the PSS, of course, as Paula is one of my favorites. Yummy stash!!! You are really progressing nicely on Riddle - I love this sampler and your stitching is wonderful Nicole! Riddle is looking so beautiful, especially the bargello parts. Nice new stash items! Don't you love fresh pieces of fabric? Nicole - You are making such wonderful progress on this piece. I love watching each part unfold. Great Stash Nicole and I see you got your bargello done. Looking good! BTW, i rec'd the fabric today! Thanks a bunch! now to figure out what to stitch on it. It's a bit different color than the 40ct but i love it! I'm so enjoying seeing your progress on this piece, Nicole. It's just wonderful! Nice stash too! The Riddle is coming along beautifully. Nice stash! Wow! I love how your Riddle is coming together~ The colors are just amazing!!!! beautiful your work, the substance and the colours. what kind of thread prepares? You're getting a lot done on The Riddle, Nicole. It's looking great! I had not seen A Sweeter Love. That is really something. Hi, Nicole! I'm able to visit you from another person's blog list! Did you get my email? Anyway, I do so love your "Riddle" it's just adorable. Have a great weekend.